Tools that are available today for tracking customer activities and automatically taking action are quite advanced. And the use of some of those tools, believe it or not, can result in the generation of physical mail pieces! In truth, few of the programs and solutions on the market pay much attention to strengthening a customer relationship via direct mail. Most of these marketing automation solutions are heavily geared towards electronic communication. But these systems may be ignoring a powerful and proven communication channel - the physical mail. 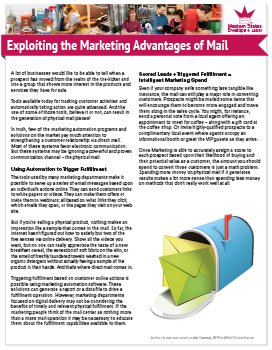 Complete the form below to download a complimentary whitepaper on 'Exploiting the Marketing Advantages of Mail'.